On April 4th 2013, the Turkish media reported that around 23,000 tons of genetically modified rice imported from United States-based companies had been seized by the Customs and Trade Ministry in the Turkish southern province of Mersin. Three Turkish companies, Tat Bakliyat, Agro Tarım and Göze Tarım were the importers. The U.S. exporters were Archer Daniels Midland (ADM) Rice and Bunge Ltd. The Mersin Police Department’s anti-smuggling department initially detained eight company executives to later arrest seven on bio-terrorism and smuggling charges. The eighth person was released pending trial. Samples from the seized imported rice as well as collected from supermarket shells were sent for analysis to the Scientific and Technological Research Council of Turkey (TÜBİTAK) and other certified laboratories according to Customs and Trade Minister Hayati Yazıcı’s statement. Prosecutors began an investigation after analysis revealed the presence of GMOs. Although the imported GMO rice was seized by the Customs and Trade Ministry (GTB) following a tip off, the Food, Agriculture and Livestock Ministry (GTHB) is the government body responsible of GMO inspections in Turkey. 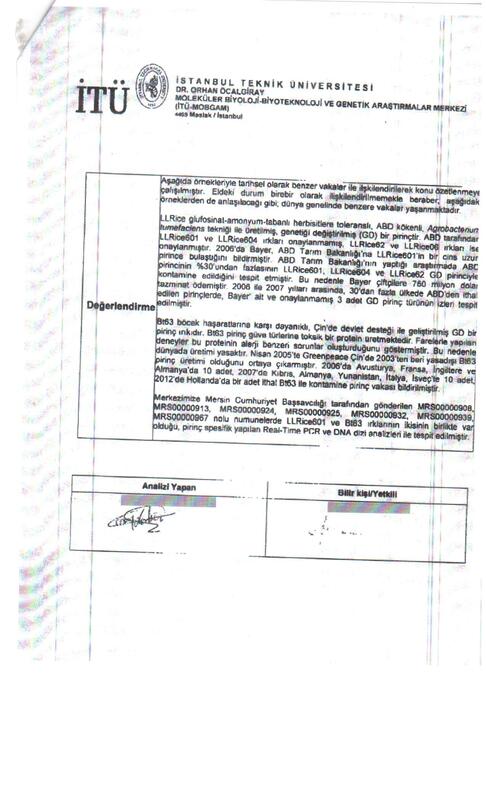 On April 10th 2013, in a press statement Food, Agriculture and Livestock Minister Mehdi Eker dismissed all allegations of any GMO food entering Turkey. “No trace of GMOs were detected in rice in any of our inspections”, he added. He also underlined that there were no records whatsoever of any GM rice being subject to international trade. Minister Eker’s press statement fell very far from the truth and was in contradiction with the Ministry regulations. According to the Agricultural Ministry, rice is cited among one of the nine “risky imported goods” and the USA is one of the nine “risky import countries”, meaning that rice imported from the USA should be 100 percent analyzed by the Agricultural Ministry before entering the country. According to USA Rice Federation, Turkey imported 147,757 metric tons of U.S. rice in 2012, valued at $63 million. Turkish rice production in 2011 was 900,000 metric tons. Turkish yearly rice consumption in 2011, reached about 500,000-580,000 metric tons. According to daily Newspaper Hürriyet, the Customs Enforcement Agency reported that these three Turkish companies imported about 100,000 metric rice in the last year, which is equivalent to 1/5 of Turkey’s rice consumption. Following my article “Minister Eker’s Dilemma: Rice is safe according to the Minister, risky according to the Ministry”, deputy Melda Onur from the main opposition party CHP, submitted to the Parliament a written question to be answered by Minister Eker. LL601 and LL62 were the GM rice found in US imports. The GM rice detected in Chinese imports was Bt63. GM rice was detected in various products such as processed food, crackers, animal feed and pet food. This report confirms that the U.S. imported rice was not contaminated by other GM products during transportation or storage, like it had been suggested by the Ministry and an (unnamed) American official at the U.S. Embassy in Ankara (more on the US Embassy Official in Part 3). 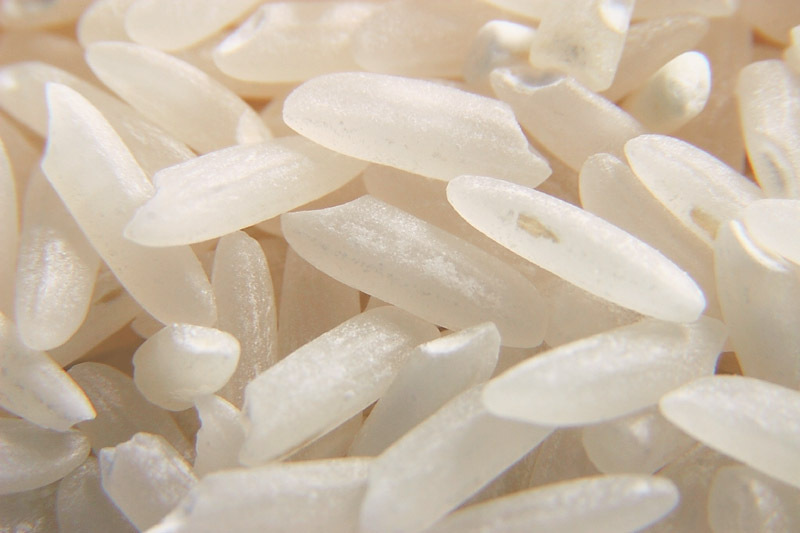 The U.S. imported rice revealed the presence of two different kinds of GM rice: LL601 and Bt63, which are not approved commercially. Perhaps, the most important fact revealed by ITU’s analysis is the presence of both U.S. (Bayer) LLRice and Chinese Bt63 in the same sample. This is the first recorded incident where two different GM Rice are found in the same sample, according to Greenpeace Mediterranean Turkey Agricultural Campaigner Tarık Nejat Dinç. Greenpeace states that although Turkey became aware of the incident at the beginning of April 2013, import documentations show the rice was imported via several shipments dating back one year -April 2012 and June 2012- and that the majority is already on market shelves, and has been -and is still being- consumed for at least the past year. GM Rice Scandal in Turkey from Us Imports Reaches International Proportions. Part2 – Who is Behind the Scandal? Bu yazı English, GDO içinde yayınlandı ve ADM, Agriculture and Livestock Ministry, Agro Tarım, ANkara, Archer Daniels Midland, Bayer, bio-terrorism, Bt63, Bunge Ltd., China, CHP, Customs and Trade Ministry, DNA Sequence Analysis, Food, Göze Tarım, Genetically modified organism, GM Rice, GMO, Greenpeace, Greenpeace Mediterranean Turkey, Greenpeace Turkey, Hayati Yazıcı, Istanbul Technical University, LL601, LL62, Mehdi Eker, Melda Onur, Mersin, Real-Tİme PCR, Scientific and Technological Research Council of Turkey, smuggling, Tarık Nejat Dinç, Tat Bakliyat, TÜBİTAK, Turkey, U.S. Embassy, U.S. imports, United States, USA, İTÜ olarak etiketlendi. Kalıcı bağlantıyı yer imlerinize ekleyin.